Home buyers generally pay between 2% and 5% of their purchase price, which includes expenses such as closing fees, appraisal fees, insurance, and processing fees. The sellers also tend to pay more at closing, as they are responsible for paying the real estate agents their commission. On the other hand, the sellers can expect to pay about 5-10% of the selling price in closing costs compared to the buyer, although this varies by location. If you are a home buyer, make sure to go through these fees line by line with your mortgage professional and understand exactly what they are and how they are going to apply to your loan. A buyer should also receive a loan estimate form early in the sale process. This document lists out all of the approximate costs and shows what the buyer will face when making the purchase, so there aren’t any surprises for unexpected fees at closing. Some buyers use the information on the loan estimate form to shop for different lenders, interest rates, costs and market comparisons. Aside from loan expenses or buying a home, there are also costs for property taxes or homeowners association dues – pro-rated and paid at the time of closing. The same is true for pre-paid loan interest. If you close towards the end of the month, the lender may ask for the first month’s payment up front. It is expected that a buyer and seller show up to the closing with knowledge of exactly what their costs of sale will be. In fact, based on the mortgage loan amount of the purchase/sale price, it’s not hard to estimate the buyer’s and seller’s closing costs. It is advisable that before you get too far into the process of home buying, ask and consult your real estate agent or mortgage professional for an estimate so you know your costs pretty close to the penny. Coming up with an extra 2-5% towards closing costs can be difficult. 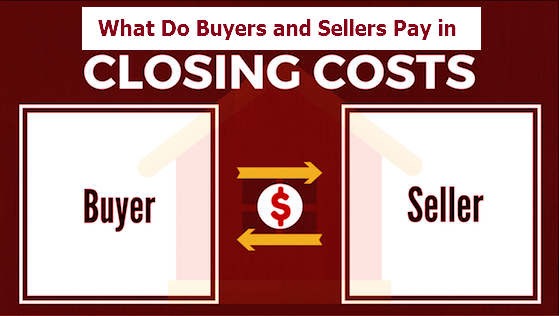 One option to minimize that burden is to ask the seller to pay buyer closing costs. It may be helpful because that is out of pocket cash that you do not have to bring to the table. It is also important to understand that if a seller is paying your closing costs, they are likely considering your offer less any extra costs so your offer is actually lower in the seller’s eyes. For more home tips, check out our blog for more information! Be sure to follow us on Facebook at Cleveland Homes for more real estate updates, tips and tricks!